Following on from successful debuts in a number of international markets, Walt Disney Animation Studio's Zootopia finally arrived in the US and Canada this week. The film has been warmly received by critics and audiences alike (check out Rachael's review here), which has seen it rocket to the top of the box-office food chain. In doing so it also managed to break a number of records. It's mammoth $73.7 million opening marks out as the biggest ever opening from WDAS, beating out Frozen to the top spot. It's not the biggest opening for a Disney released animation full stop (Toy Story 3 still has the crown overall) but still a very impressive achievement. Outside of that, it also managed to become the fourth biggest March opening overall. It's too early to say if this film has legs (although we think it has a least four... see what we did there?) but signs are good. It's set to have a clean run at the box office for some time, with the next major family release being The Jungle Book (also from Disney) due in mid-April. 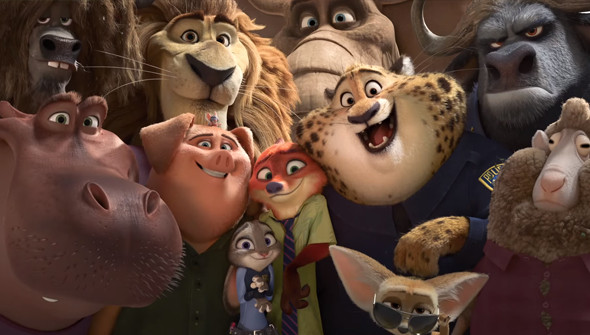 Could Zootopia ultimately actually top Frozen's huge success? We wouldn't actually count it out, as this potentially has even wider appeal than that chilly juggernaut. Certainly, anecdotal evidence seems to suggest that the film could do some serious numbers in repeat business, with the reaction "I can't wait to see it again" being seen all over. It's exactly that kind of thing that helped drive Frozen's success. This is an interesting turn of events, seeing as all indications seemed to suggest that Moana was being lined up as the natural heir to Elsa's crown. The film will open under the title Zootropolis in the UK on March 25th.